The last Buddhist kingdom in world, Bhutan is undeniably a fascinating country. Its peaceful transition from a young monarchy to a parliamentary democracy; its sparsely populated, unspoiled terrain; its national commitment to valuing happiness in a holistic sense over mere economic development; and its reactions as it confronts modern cultures and ideals – all keep the Land of the Thunder Dragon in the forefront of the world’s imagination. With so-called “exotic subjects” there is always the danger of an artist playing into the audience’s fantasies, stripping some of the realism that keeps a piece grounded. Wehrheim’s work cannot be accused of romanticization, and readers will benefit from his careful attention to capture snippets of some of Bhutanese culture through not just stunning black and white portraits and landscapes, but with maps, introductions to Bhutanese history, dialogues and anecdotes drawn from over 15 years of travel that contextualize the images nicely. The 280-page book (now in a paperback version) is sizeable, but not as cumbersome as its hardback cousin. 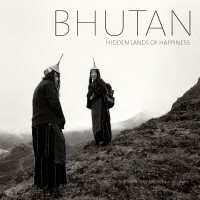 After reading, you may want consider checking out Bhutan: Taking the Middle Path to Happiness, a DVD produced by Wehrheim, in order to capture the sounds and color of Bhutan and expand your understanding of how Bhutan’s government and self-identity are being shaped in the new millennium. 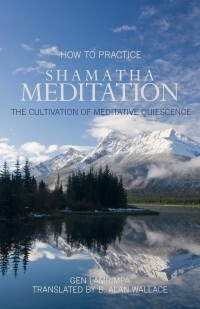 How the Practice Shamatha Meditation: The Cultivation of Meditative Quiescence is the result of a one-year retreat for Western meditators led by Gen Lamrimpa in the Pacific Northwest in the late 1980s. The book is a record of the oral teachings given to the group which focused exclusively on the practice of meditative quiescence (shamatha). An invaluable guide for practitioners wishing to develop greater stability and clarity in their meditation. Gen Lamrimpa, Ven. Jampal Tenzin (1934-2004), was a close disciple of His Holiness the Dalai Lama. He was renowned as an accomplished practitioner of meditative stabilization, in addition to many tantric accomplishments. The actions of body, speech and mind are viewed as the pathways to enlightenment in all of the Tibetan Buddhist lineages. Learning how to work with them is essential for progressing along the path. 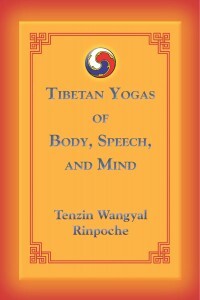 In The Tibetan Yogas of Body, Speech, and Mind, Geshe Tenzin Wangyal illuminates the ways in which the subtle activities of body, speech and mind can be utilized as tools toward happiness, contentment, better health and ultimately liberation. Geshe Tenzin Wangyal Rinpoche is the founder and spiritual director of Ligmincha Institute in Virginia, USA. The Institute was founded in 1992 in order to preserve the ancient teachings, transmissions and practices of the Bon Buddhist tradition of Tibet. Looking after the well-being of citizens is not easy, but it isn’t impossible! After traveling to many countries and living in quite a few, I always wonder why people from less developed countries seem more contented than those from developed ones even though in the capitalistic model it is said that if people can get what they need/want they’d be happy. But is this the case for rich countries? Governments measure the health of their economy relying on GDP (Gross Domestic Product), a statistic constructed in accordance with the view that what drives an economy is consumer demand. In the model, each individual’s desire sets in motion economic growth. But, such uncontrolled and unregulated desire disregards certain facts: the limitations of the natural environment to provide resources, globalization and its ill effects, etc. Besides, does economic growth lead to contentment? There is a growing interest in some policymaking circles in looking at ways to measure contentment itself and one approach is the Gross National Happiness (GNH), a measurement that takes into account non-economic factors in determining the overall happiness of a country. Currently, only one country in the world implements GNH as a part of public policy: Bhutan. 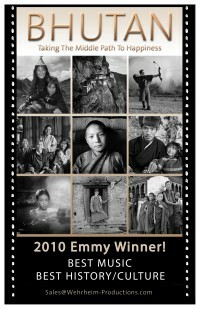 Bhutan: Taking the Middle Path to Happiness, winner of the 2010 Emmy for “Best Music” and “Best History/Culture,” gives you the opportunity to ponder this fascinating topic and witness how this country is piloting this ambitious project. In 1975 during their first trip to Europe, Lama Yeshe and Lama Zopa Rinpoche gave a weekend seminar in England, once again demonstrating their charisma and knowledge, and the profound effect of Buddha’s wisdom on Western people. 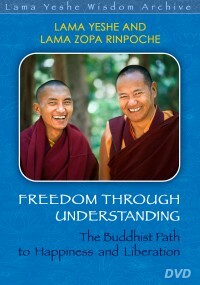 Freedom Through Understanding (also available in an abridged format as a book) covers the purpose of meditation, bodhichitta, the importance of motivation, tong-len and the shortcomings of attachment, among other topics. This is some of the earliest video recordings of Lama Yeshe and Lama Zopa Rinpoche available, and it is a treat to see Lama Yeshe’s dynamism and expressiveness and Lama Zopa Rinpoche’s depth of understanding and burgeoning teaching style on these subtitled videos. 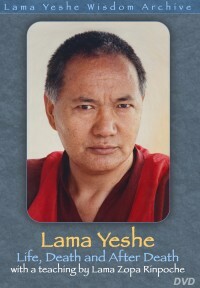 First published as a free book by the same tile, this newest DVD from Lama Yeshe Wisdom Archive is from Lama Yeshe’s last teachings in the West, a weekend seminar on death and after death in Switzerland in 1983. Although at this time Lama Yeshe told his students he would die soon, his boundless energy and joy were used as reasons to believe that maybe he wouldn’t disappear too soon. He died five months later. The DVD also includes video of Lama teaching on transference of consciousness at the time of death in London the previous year. Most, if not all, of the children that are part of the Tibetan community in exile have never seen Tibet and it remains a remote possibility for as long as China upholds its detrimental political policies. The title of this book is deceptively simple: it is not just asking for a place but also for place itself – if I am Tibetan but not in Tibet, where is my place in the word? Halpern’s book, written for children, attempts to answer that immensely important question. 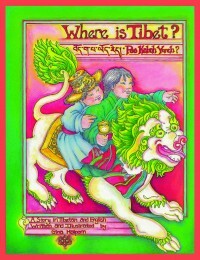 Using English and Tibetan languages and bold images with gentle colors, Where Is Tibet? offers a positive and optimistic answer. 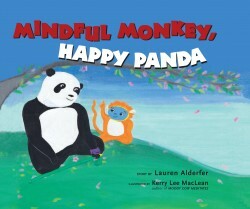 Disguised as a bedtime story for children, this approachable book for all ages discusses, in simple terms with lively animation, how our “monkey mind” doesn’t allow us to be present in our daily activities, and instead, is often preoccupied with anything but the current moment. A thoughtful book for children, and an enjoyable reminder for adults.